Scottish companies are to be given a better chance to influence UK Government trade policy through the creation of a new group chaired by Scottish Secretary Michael Moore. UK Trade Minister Lord Green is meeting with a range of Scottish business interests in Glasgow this morning to discuss the proposal. Hosted by David Mundell MP and the Scottish Council for Development and Industry (SCDI) the session with Lord Green is examining ways in which the UK Government can help Scottish more Scottish companies do business overseas. The UK Government wants to draw on the expertise of bodies such as UK Trade and Investment (UKTI), Scottish Development International (SDI) and SCDI who are all working hard to help Scottish companies do more trade across the globe. The Glasgow meeting is part of a two day Scottish programme where Lord Green has met bosses from Scottish business and enterprise bodies. Many of the most important policy levers are controlled by the UK Government and Mr Moore believe Scottish firms need a clearer voice when it comes to influencing decisions over better regulation, international trade agreements and improving access to overseas markets. The Scottish Secretary said it is more important than ever that the different parts of the UK and Scottish Governments are all pulling in the right direction when it comes to helping Scottish companies. 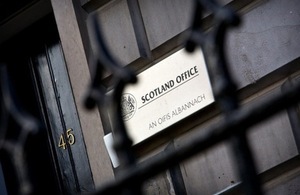 “I want to see more small and medium sized Scottish companies trading overseas. It is vital to Scotland’s future economic prospects that this happens. The UK Trade Minister has heard from Scottish business how the Government can help them trade across the world. I want Scottish business to have a more regular and direct channel to influence UK trade policy. A new Scottish trade group can help us achieve this.